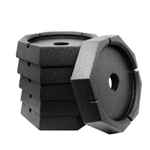 The RV SnapPad HiWay-8 are jack pads that permanently attach to the footpads of your RV's leveling system. 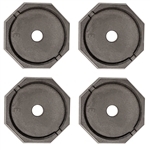 The jack pads can be installed in minutes and increases stability by making your leveling system's footpad larger and conforming to uneven terrain like gravel. Features anti-slip rubber meaning no more popping jacks, or slipping in high winds or on slick surfaces. NOTE: Not compatible with LCI, Atwood, Equalizer, Bigfoot, or RVA jacacks.